Place chicken breasts into the slow cooker. Add the salsa, corn, and blacks beans. Cook on low for about 4-5 hours or until chicken is done. Take out the chicken and shred it. Return the shredded chicken to the slow cooker. Add the cream cheese to the slow cooker and let it sit on top for about 30 minutes. Once the cream cheese is soft stir it into the chicken mixture thoroughly. I have a friend that only makes meals that take fifteen minutes or less of preparation. It’s a rule she set for herself years ago as a busy working mom and has stuck by it since. This meal might blow her mind because this Slow Cooker Fiesta Chicken took me less than three minutes to prepare. 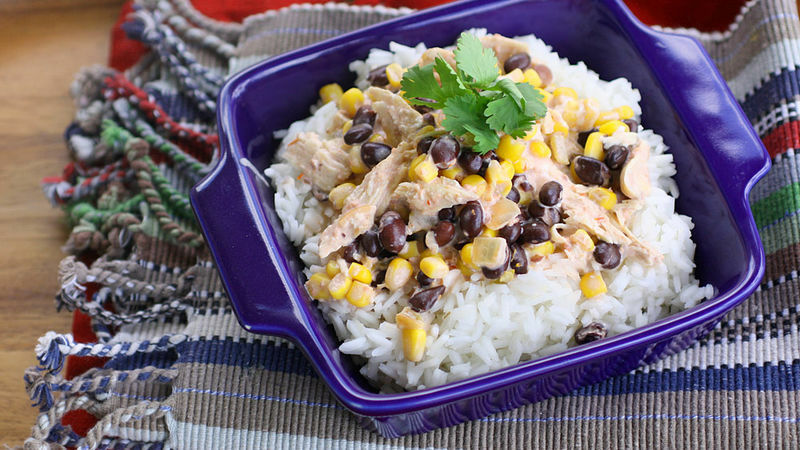 It’s a creamy Mexican inspired dish with chicken, black beans, corn, salsa, and cream cheese. It’s one of my family’s favorites! This Fiesta Chicken is perfect for those busy days where time is short. Just this past Sunday, my whole family was in the car waiting for me as I was throwing the last couple of ingredients in the slow cooker for this meal. As I opened the jar of salsa I tripped on a toy and the salsa ended up all over me. It was in my hair, on my neck...and necklace, and all over my white blouse. I hurried and changed clothes, wiped my neck and tried to carefully wash the salsa out of my hair without completely ruining my curled locks. Satisfied with my quick clean up I jumped into the passenger side of the car and my husband took a whiff and said, "Umm...did you just eat chips and salsa?" Great. I guess my clean up wasn't good enough and we were already too far to turn back. Nothing like having people wonder why they’re craving Mexican food while standing next to me. Awesome. I guess I might have to invite them over for dinner so they can taste how good it is! For more slow cooker chicken recipes check out our some of our favorite recipes here.